The Canterbury earthquakes signified a nor’wester-worthy gust of wind to the burnished flame of the ‘Christchurch Style’ of architecture, snuffing out much of that era’s celebrated oeuvre. Fortunately, Tobin Smith and Blair Paterson, of CoLab Architecture are tending the flicker that remains, providing oxygen to the essence of those mid-century ideas and fuelling their evolution to relevance for this century. The Dorset Street Townhouses are a case in point. 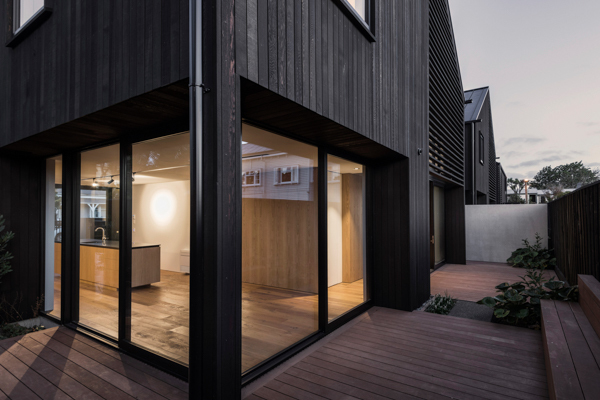 Located in an architecturally important area of the city where streets run rib-form from Hagley Park to the city, the three standalone highly-specified townhouses replace a monolithic art deco block of four flats. The area’s rich grain of townhouse typologies inspired the gable rooves and elegantly dense forms clad in dark vertical and horizontal cedar. 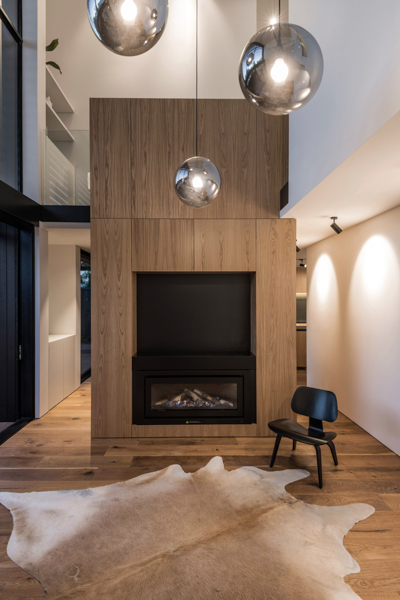 Proximity to the wooded acres of Hagley Park made the use of timber an obvious choice, with the radiance of oak flooring and joinery complementing the double height living room indoors and wooden louvres tempering the window expanses outside. All the company’s joinery is custom made and installed by Cutting Edge Kitchens, which understands the look CoLab is going for and recognises the importance of getting the details right. “On any job we’re happy to talk through options and discuss with them available alternatives in style and price,” Jonathan says. Getting materials on site was sometimes challenging for Project Manager Jade Muirson and his team, given the narrow but surprisingly busy streets. However, the effort was more than worth it and they are thrilled with how this high-profile build has turned out. 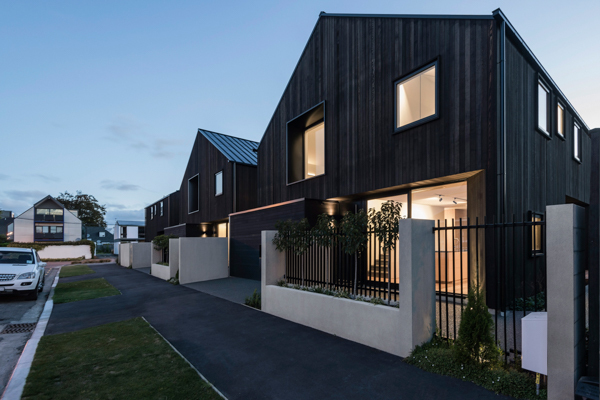 Bringing diversity to design post-earthquake is important to CoLab and the judges have taken note with this project shortlisted in the Canterbury competition of the NZIA Awards: Multi Residential category. CoLab has been an award-winner each year it has entered; not surprising given its ethos of articulation of local characteristics in form, “don’t force an idea if it doesn’t suit an area”.